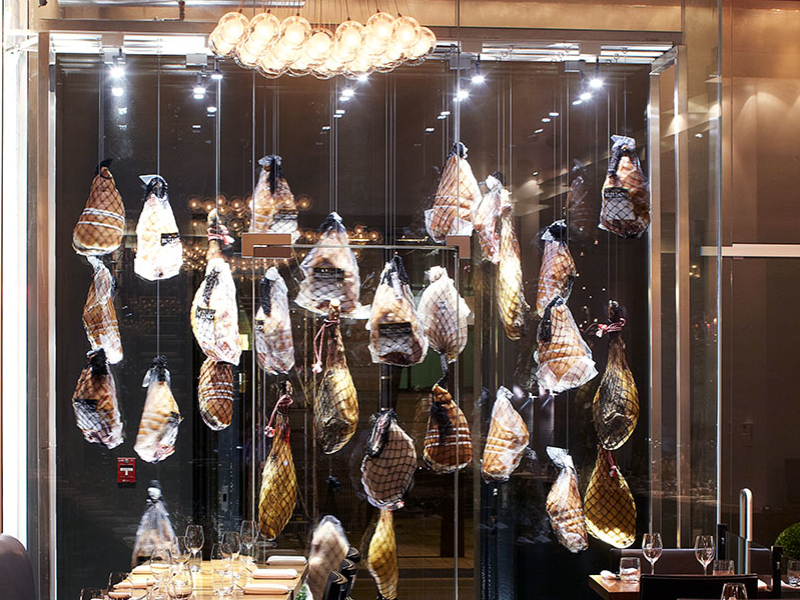 The design mission was to shed the gloominess of the previous restaurant design and introduce a sparkling white, glamorous space; a trendy and casual spot where specialty cured meats from Spain, Italy and France are the stars of the show. The vibe is reminiscent of a Soho hot spot, with just the right French touch. With its communal dining table running down the central aisle of the space between the columns, the concept is a destination for diners seeking an animated setting. The nature of the food specialty influenced the choice of materials with the notion of meat, and especially raw meat, guiding the design approach. The design of the restaurant leans towards machismo with some feminine touches. The dichotomy of the lowly ham greeting visitors in a lit glass showcase is a humorous take on the status of the pig and the restaurant's brand.